On a couple of brilliant blogs recently I've seen the mention of Bento and now thanks to Capture by Lucy and My two mums I'm now hooked. It's all about the Japanese art of preparing food all in one box that gives a balanced meal and is eye catching and cute, often crafted into animals or themes within the box. There should be a mix of fruit, vegetables, grain and protein and attractiveness is the key. There are all sorts of accessories to compliment your creation and lots of places recommend using silicone muffin cases and seeing as I've got some mini ones I decided to give it a go and my first attempt is below (I'm starting small). Elephant toast, pink salmon and carrot ribbons in one side and a mixture of fruit in the other, I'm hoping to up my game and create more interesting boxes as I get used to it but the elephant toast was a big hit already. 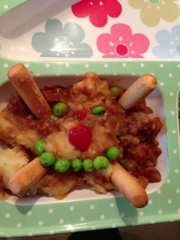 I've started following some Bento specific blogs where mums literally post pictures of every lunchtime meal they prepare for their children. Some of these are really breathtaking and brilliantly executed and inspired me to have a go myself. I'm only starting small and I have already amassed a collection of cookie cutters in various animal shapes (much to my husbands annoyance) because I've always quite liked trying to make Bubba's meals eye catching and given her small portions of lots of different things in one sitting. My child has always eaten with her eyes and prefers things that look nice - for instance she won't eat a normal sandwich made by me but if I cut it into the shape of an elephant she will devour it. So this Bento lark is right up my street and it's really addictive. 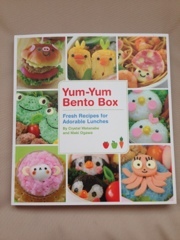 I've bought myself a gorgeous book on how to make Bento boxes up and giving ideas of how to make some of the animals and read Lucy's blog extensively as she gives brilliant advice too. I'm so excited at the prospect of compiling innovative lunches for Bubba and if I'm honest myself too because who doesn't love the idea of a perfectly eye pleasing packed lunch. It's also making me think more about what I'm feeding Bubba and myself for lunch and trying to think outside of sandwiches.